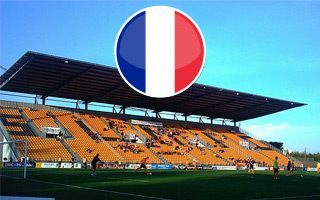 We’ve just added two stadiums to celebrate France reaching the Euro 2016 final. We’d like to confirm they’re new, but they’re only new to StadiumDB, both are in desperate need of replacement. Yet, since it’s not coming for years, here are the stadia in Laval and Niort! The last Euro 2016 batch of stadiums will come on Sunday, following the tournament’s final. Will they be from France or Portugal? When built in 1971, it was created as a typical football/athletic stadium with low landfill stands. This began to change with the ascend of Stade Lavallois MFC, who reached the top level in 1978. Some of their games drew large crowds, even exceeding 100% occupancy. On the south side the stadium has its main grandstand, which originally was equipped with one of the world’s most unique roofs. Unfortunately, the structure only lasted several years before needing to be removed due to leaks and instability. The stand itself exists to this day with a new, partly transparent roof. Also to this day the low terracing behind each goal is available. However, the life of the running track ended in 2001, when the field was moved towards the south side, making room for a new grandstand. The north side is a large, covered, but still only a temporary tubular stand for almost 5,000 people. It was economic enough to require complete replacement of the steps by 2011 because of corrosion, which resulted in only the roof being left in 2012, until new tubular skeleton was set up underneath. Clearly, many of works over the years were only short-term solution and to this day the stadium requires heavy investment to meet expectations of the club. Despite many announcements and plans a major redevelopment is yet to come. The multi-use stadium in Niort has been used by local professional football club Chamois Niortais since its earliest days. Built with one concrete grandstand in the west and landfill stands in the east, the building still has exactly these facilities. When opened, this stadium was built with a beautiful, romantic name of Venise Verte (Green Venice). To this day this name is in use, though officially the stadium naming celebrates former mayor of Niort, René-Gaillard.